Therapists’ couches are littered with the remnants of clients suffering with worry and anxiety (and fear stress) and other life-sapping emotional issues… even after months or years of “talk” sessions. Television bombards us daily with ads for mood altering drugs with the Big Pharma racking up annual revenues of $70 billion, according to the New York Times. Talk is seldom enough and drugs are not curative. However, new approaches have now evolved within the field of Energy Psychology rapidly transforming people’s lives. 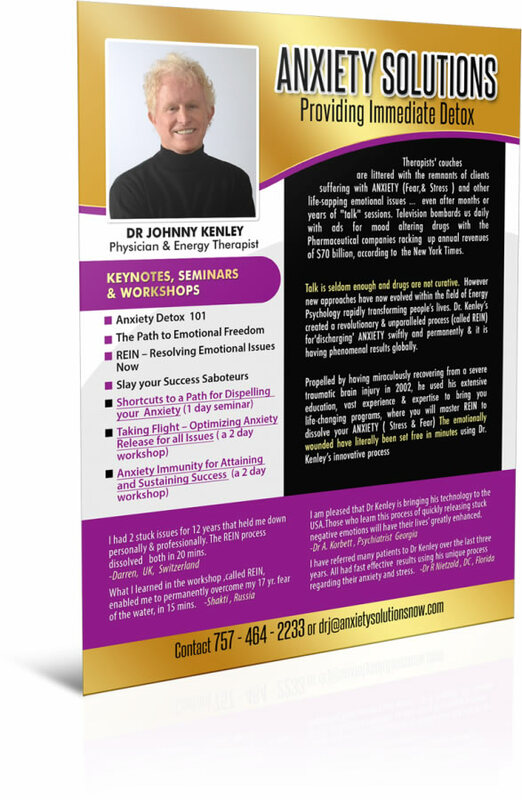 Dr. Kenley has created a revolutionary & unparalleled process, called REIN, for “discharging” worry and anxiety swiftly and permanently. REIN is having phenomenal results globally. Act now to bring Dr Kenley to your business, organization or institution by providing the following information to insure a prompt response. For an immediate response,directly contact Dr. Kenley at 757.214.4800 or email him at drj@anxietysolutionsnow.com.